(Bloomberg) -- The prospect of many small parties gaining parliamentary seats in Thailand has dented the claim by an anti-junta coalition that it has a majority following March’s general election. An Election Commission statement Friday said more than 25 parties will receive lower house seats based on the proportional representation system in the military-backed constitution, implying many small parties will enter the legislature. The agency was trying to address prevailing confusion about how the system works, but isn’t expected to release official results until early May. The comment signals that the coalition trying to block the junta’s proxies from retaining power may have overestimated its seat strength, as some will go to the smaller parties, according to Punchada Sirivunnabood, an associate professor in politics at Mahidol University near Bangkok. 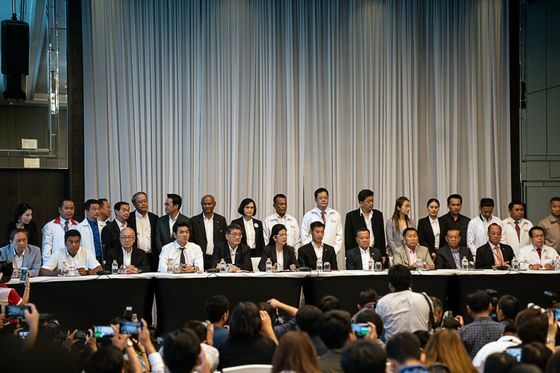 The Pheu Thai party, which is linked to exiled former premier Thaksin Shinawatra, said after the election it had formed a seven-party coalition that unofficially would have 255 seats in the 500-member lower house. On Sunday, Pheu Thai spokeswoman Ladawan Wongsriwong said in a statement that there were irregularities in the seat calculations implied by the Election Commission clarification on Friday. The alliance is seeking to prevent a party carved out of the ruling junta, Palang Pracharath, from retaining power. Palang Pracharath disputes Pheu Thai’s claim of a majority, and has said it’s on course to form a government and return junta leader Prayuth Chan-Ocha as prime minister. A junta-appointed 250-member Senate as well as the elected lower house will vote on who becomes prime minister, giving the military’s allies the upper hand in installing their preferred candidate even if they fall short of a lower house majority. Thailand’s military establishment has been accused of seeking to blunt the opposition to retain power, most recently via a sedition charge against the leader of Future Forward, a young party that surged in the vote and is a key part of the anti-junta coalition. Future Forward leader Thanathorn Juangroongruangkit, who expects to face a military trial, has rejected the sedition charge. The military government has said it’s not trying to undermine anybody or any political groups. In the lower house, 350 seats were contested on a first-past-the-post system, with the remaining 150 allocated using a method of proportional representation. The disputed and inconclusive March 24 election followed five years of military rule. Pheu Thai emerged with the most seats, but Palang Pracharath won the most votes. The poll agency has until May 9 to certify the results. The seat outlook could change again because of recounts and voting reruns in some areas, sparked by discrepancies between the number of registered voters and ballots cast.